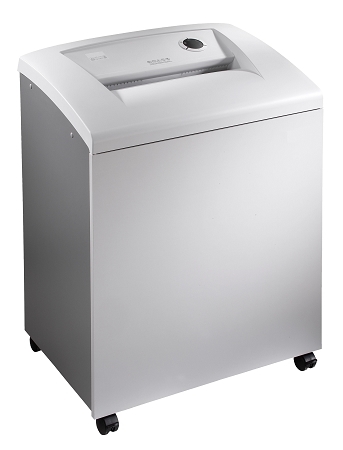 A Level 3 cross cut shredder designed for large office or departmental use. The F-16X2 shredder is engineered to give many years of trouble free use. Built with a cutting head precision milled from solid blocks of Solingen steel and housed in an all steel frame, the F-16X2 will easily handle CD's and credit cards as well as paper clips and staples. A Thermally Protected Motor, Chain Drive and Steel Gears all provide for maximum slip-free power. The All Metal Drive system uses no internal nylon or plastic gears as is common in lower quality shredders. The Energy Management System places the shredder in a sleep mode when idle and completely powers down after 30 minutes of inactivity. The operator control pad includes all the functions of the shredder and a safety interlock shuts off the shredder when the bag is full or the door is open. An Auto-Reverse feature prevents overfeeding and reduces jamming. The rubber shock mounts isolate the cutting head noise and vibration and an attractive wood sound deadening cabinet provides for quiet dust-free operation. Swivel casters allow for easy mobility. Includes a Lifetime Warranty on cutters.